We all struggle with choosing – and sticking to – a direction for our business. In the beginning, you probably didn’t even have a direction in mind. You just had something you loved to make, and you wanted to start selling it. Things like finding your ideal customer, marketing, goal-setting, long-term planning, and conscious product development were likely not even on your radar. You might not have even planned on having a ‘business’. But now you’re here. You’ve realised that you not only love making things – you love being able to share them with the world, and make money doing so. You’ve crafted yourself a business. But are you clear on where you want to drive your business to? Or is it driving you? Camila Prada – one of the successful makers I profile in the SHIFT Gold Member Case Studies, has this to say about finding direction. [Struggling with direction is] a constant for me. I think it is for most entrepreneurs, simply because of the fact you have to switch back and forth from CEO mode to worker bee mode. As the creator of a business you are always second guessing yourself, questioning, thinking of how to make things better.This makes it hard to execute plans in a focused manner, and of course YOU have to execute these ideas and plans yourself at the beginning, as there is no one else to do it. Another of our Case Studies, Tracey Matthews (you might know her from Flourish & Thrive Academy) actually grew her first jewellery business to a huge level of success over 10 years… then let all of that go to re-start with a completely different business model for her jewellery. I totally agree with Tracey. I wrote about this on the blog recently – the terrible habit of not taking action because we’re waiting for something… whether that something is more time to think through a decision (hint, there will never be a point where you are 100% confident… about anything) waiting for perfection, waiting for the ‘right time’… or any of the other myriad excuses we make to ourselves about why we haven’t taken action. The 4 makers I profile in the SHIFT Gold Case Studies all have this one thing in common. They have made decisions (sometimes, really tough decisions) and then enacted them. Another thing they have in common is a clear direction. They know who their customer is – and who their customer is not. They are not trying to be everything to everyone. They know what they want, and every decision they make drives them closer to their chosen destination. Do you have this clarity? Or are you still floundering, lurching from task to task, always feeling like you’re behind the game? If you’re driving your business aimlessly, it’s time to make a shift. I created SHIFT – my e-course for makers and creatives – to help you do exactly that. Because I’ve been in your shoes. It took me years to get clear on what I wanted my jewellery business – Epheriell – to be, and the direction I wanted to drive it. 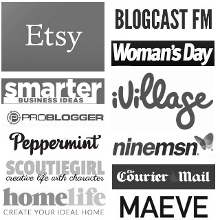 From when I started it as a hobby in 2008, it took me 5 years before I finally got really clear and focussed as to what direction to take my biz. Sure, I had attained some level of success – I was making regular sales, and making money. But things were growing slowly, and it wasn’t until I consciously chose a specific, defined direction that things really took off. Once I got that clarity, and committed myself to one micro-niche, my business exploded. In fact, my jewellery business revenue in 2014 was double my revenue in 2013. And that was after culling over half my product line! Attaining this clarity and direction makes everything so much easier. Your marketing, product development, time management, heck, even the amount of supplies you need to keep on hand. It makes things simpler, more straightforward, and you clear so much mental space because you’re not wasting time constantly asking ‘this or that’? You know your Core Values, you know what part you want your biz to play in your life, and you know your WHY. If you need help finding this clarity and direction for your business, join me and a passionate group of fellow creatives for SHIFT. To register for the March class, click here. The course kicks off March 9th and runs for 30 days. Registration closes Sunday morning, AEST. As with all of my courses, you get lifetime access to both the content and the private course forum. I hope you’ll join us and #SHIFTyourbiz in 2015! P.P.S. If you have any questions about the course after reading the course page and FAQs, just leave a comment below or email me and I’ll get back to you asap.